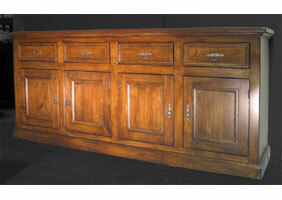 The 4 Door Sideboard has four doors and four drawers with flat base moldings. The drawers are on wood runners for ease of opening, the drawer faces have beveled molding. The doors have panels with flat insets with raised molding. There is one shelf behind the four doors, it is centered in the opening and spans the width of the cabinet. 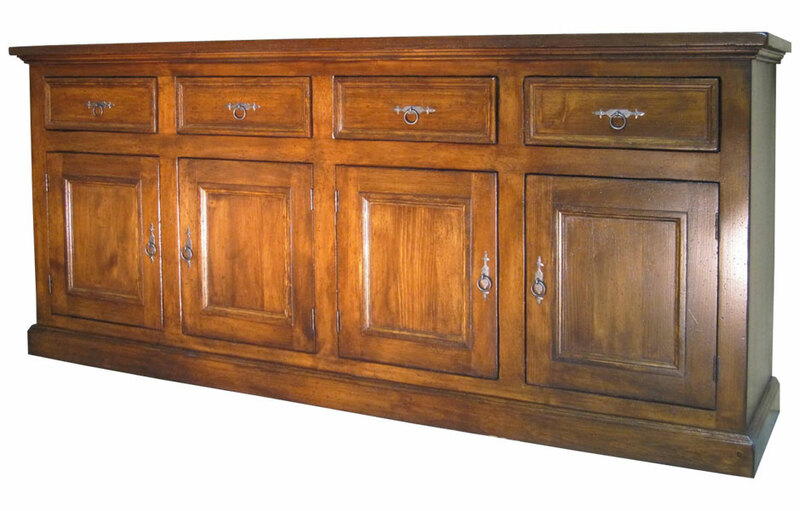 The Bordeaux 4 Door Sideboard adds French elegance and storage to a dining area. 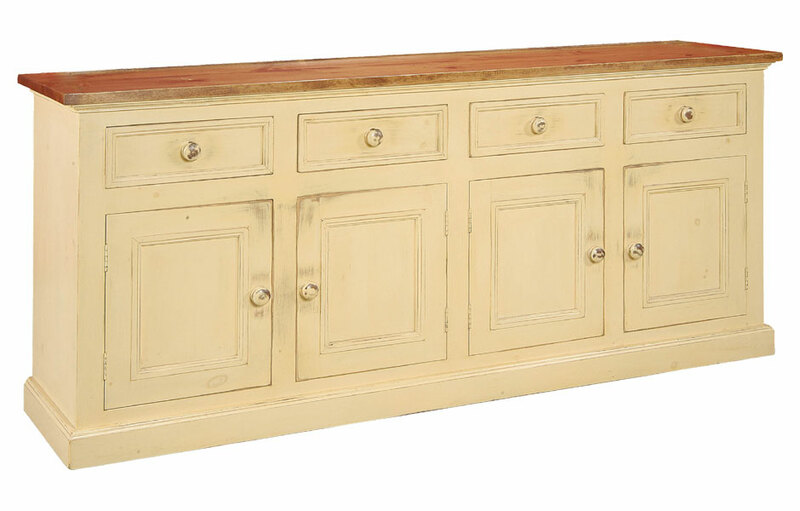 The wide sideboard offers plenty room for storing table linens, flatware and all the good china. 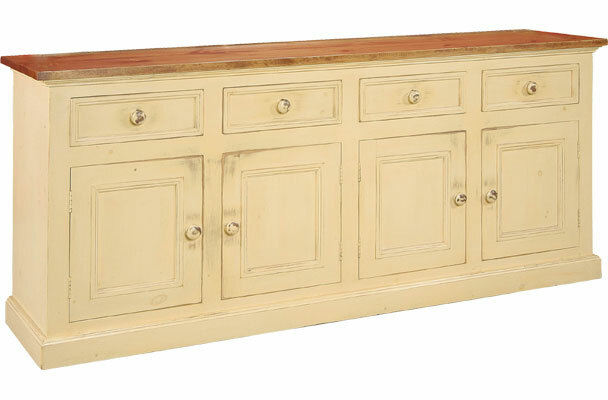 The classic French styling adds gravitas to the wide console buffet. The 4 Door buffet has four doors and drawers with flat base moldings. The drawers are on wood runners for ease of opening. The drawer faces have beveled molding and the doors have panels with flat insets with raised molding. There is one shelf behind the four doors, it is centered in the opening and spans the width of the cabinet, and can be folded up for storing large scale items. Our sideboard top is water-sealed to stand-up to daily use, and can be used for food and drink service. 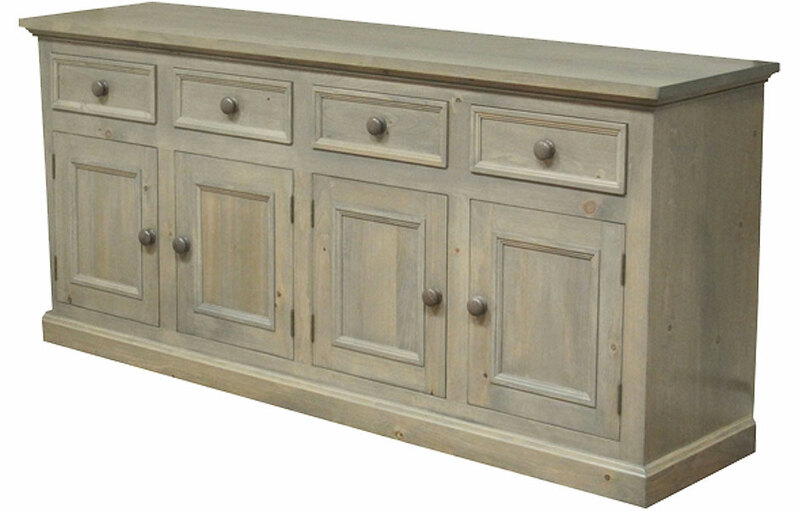 The long sideboard is handcrafted and hand-finished in your paint or stain of choice. The 7ft. sideboard can be painted in a classic two-tone finish with a stained interior and top with painted exterior, or all-over one color. The versatile sideboard can be used as a media console for large flat screen TVs, bedroom console, home office storage or low wide storage console in any room. The Bordeaux 4 Door Sideboard complements French Country, English Cottage, Farmhouse, Rustic, Transitional and Traditional style decors. 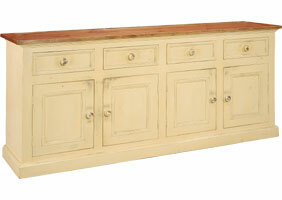 4 Door Sideboard finished in Buttermilk. 4 Door Sideboard finished in Tuscan Sunset Aged Finish.